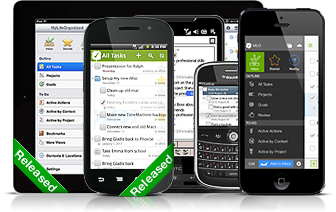 Looking for a Task Manager? Every day many of us spend the time on urgent but low priority tasks while the most important tasks get put off until another day. Unfortunately, “another day” never seems to arrive. If you keep putting things off, you'll eventually wake up one day and realize life has passed you by. MyLifeOrganized software helps you to think and act differently – and doing things differently is the first step in digging yourself out of the procrastination rut. The main idea of MyLifeOrganized is to help you to plan and organize your time in such a way that you accomplish your most important goals as quickly as possible. Organize your goals, projects and tasks into a tree and MyLifeOrganized will generate a simple To Do list of actions for you. This list will contain only those actions that require immediate attention. The To Do list will be sorted in order of priority so that you can stay focused on what is really important to you. One of the key advantages of MyLifeOrganized is that despite being a very powerful and sophisticated piece of software it is extremely easy for even the most novice computer users and the "feel" of the program is very lightweight. It will not replace your Calendar, Outlook or Excel, but it will help you to organize your tasks and generate concrete and sequential list of specific actions to achieve your goals as quickly as possible. MLO is being constantly improved so join MLO community to share your ideas. Getting Things Done® (GTD®) in MyLifeOrganized. 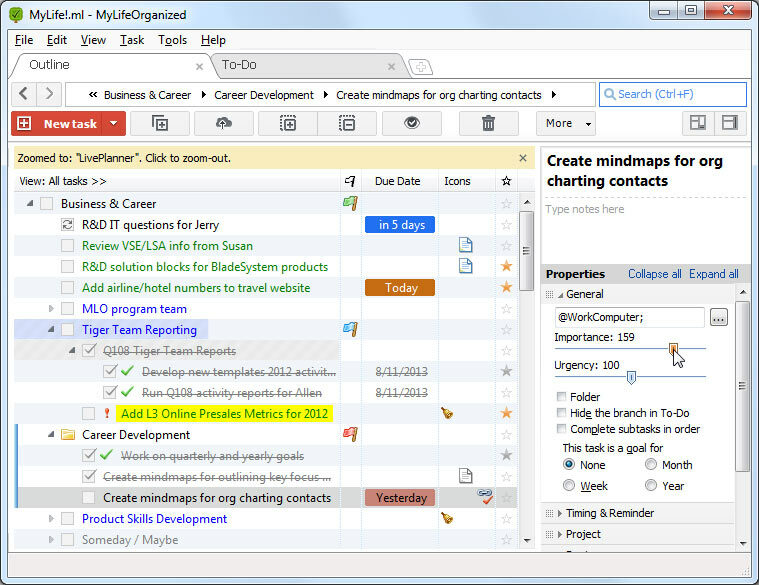 Use the MyLifeOrganized Outliner to organize your goals, projects, and tasks into a tree. First, write down the tasks that you would like to accomplish. 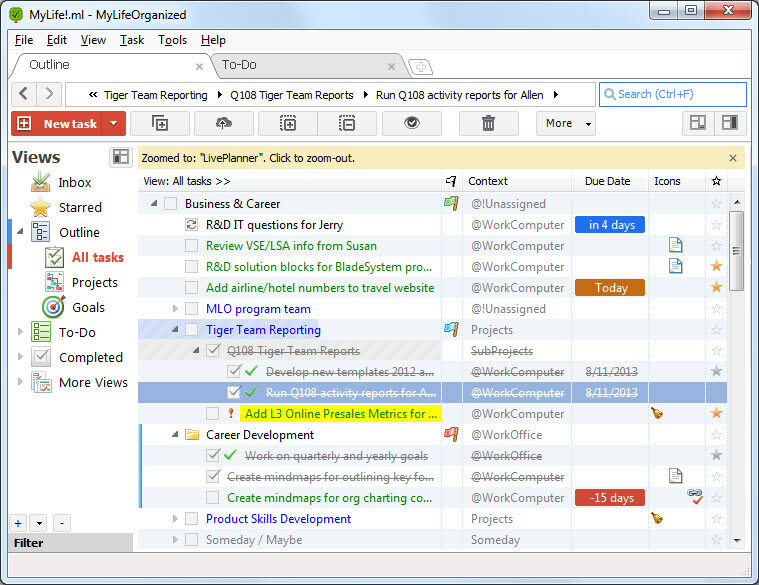 Then, if the tasks are large, simply break them down into their component elements (subtasks). If these components still seem large, continue to break them down a until you have a list of reasonably sized subtasks. Ask yourself, "What are the most important tasks?" For each task, you can specify its importance in relation to its parent task or project in the outline. To increase the importance of a task to its parent task, drag the Importance for parent slider to the right. Note: when you set the priority of a task in most other To-Do programs, you actually set its absolute priority in comparison to all other tasks in the list. In MLO, however, you should only consider how important it is to complete the task relative to completing its parent project. If you change the importance of a project with subtasks, the placement of all its subtasks in the To-Do list will be changed simultaneously, without your having to change the importance sliders for those subtasks individually. Many tasks in your list can be completed only in certain contexts (places or situations). For example, you can complete the task "Buy compact disc" only when you are in a music store. Thus, you will want to create a new context named "Music store", and assign this context to the task. Later on, you can filter the To-Do list by assigned locations. Since a context can include other contexts, it is easy to construct a realistic model of your everyday places or situations. This model will help you stay focused on tasks that require your immediate attention. After you have entered all your goals, projects, and tasks into the Outline, MyLifeOrganized can select only those tasks which require immediate attention and place them to the To-Do List. This list is also called the list of Next Actions. The scheduled tasks appear in the list only at the most suitable time. You can filter the To-Do list by setting the appropriate context. 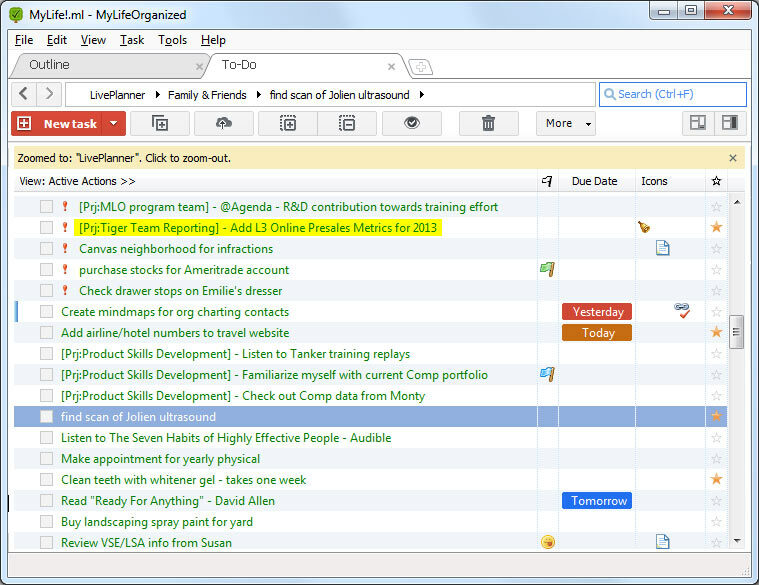 Each time you complete a task the To-Do list is regenerated to keep it updated and right ordered. The To-Do list is sorted in priority order so that you can stay focused on what is really important to you, separate importance from urgency, and overcome procrastination. 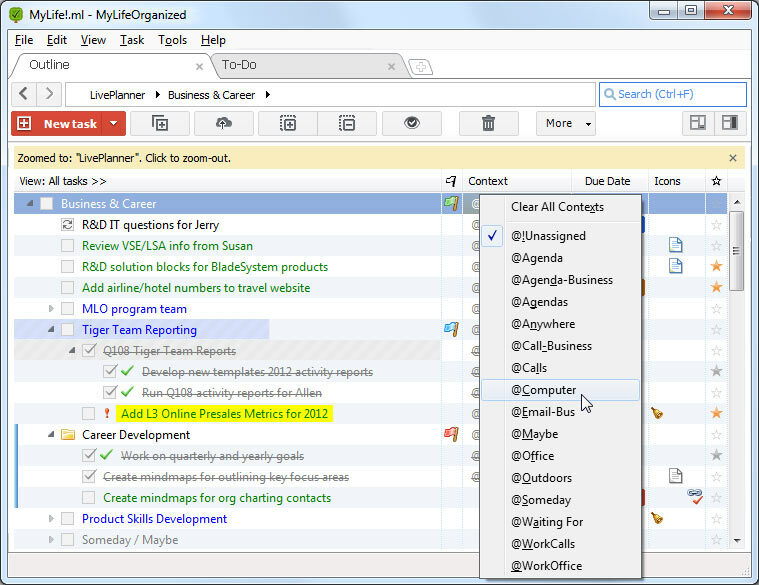 There are mobile editions of of MyLifeOrganized application which can be synced with MLO for Windows Professional edition. The following MLO mobile applications available: MLO-iPad, MLO-iPhone, MLO-Android.